Visit Hunter Bay Coffee online at HunterBay.com for delicious Montana-Made Hunter Bay Coffee. 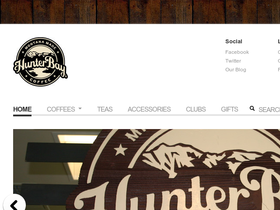 Hunter Bay Coffee has a vast selection of gourmet coffees, organic coffees, espresso coffees and decaf coffees. Be sure to sign up for Hunter Bay Coffee Coffee's of the Month Club. Visit 58Coupons.com to learn about the latest Hunter Bay Coffee discounts, Hunter Bay Coffee coupons, Hunter Bay Coffee sales and Hunter Bay Coffee promotions available for Hunter Bay Coffee at HunterBay.com. With your monthly membership to the Roastmaster's Coffee Club you will receive 2 free Hunter Bay coffee mugs with your first shipment, plus two 2-ounce sample coffees with every shipment. Click link to get started. Sign up for Monthly Membership at HunterBay.com and receive a 2 lb fresh-roasted bag of gourmet coffee once per month for only $24.95 - and shipping is free! Click link for details. Hunter Bay Coffee also sells gourmet teas for only $4.95 per tin (24 bags per tin). Shop for black, green, mango, raspberry or Montana premium tea at HunterBay.com. Click link to get started. Buy Organic Coffee from HunterBay.com where they have a great selection of organic coffees for only $9.95. Click link to browse.